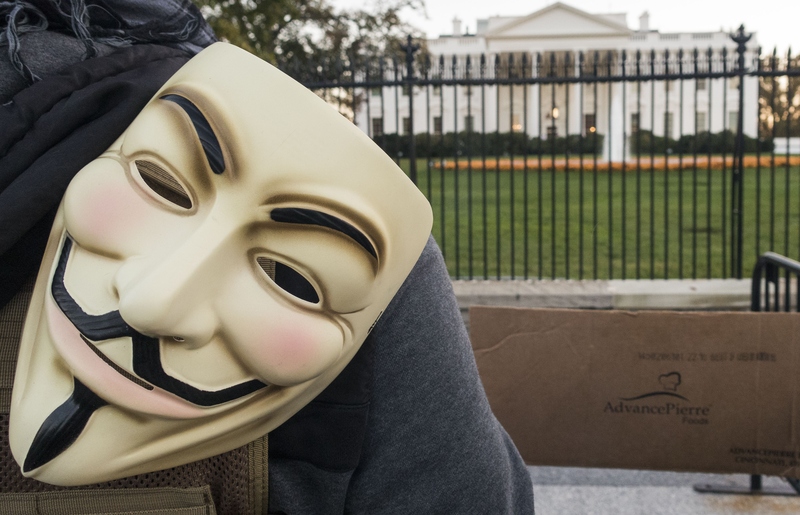 What Will Anonymous Do In 2016? Steven Avery's Case Won't Be The Only Issue Taken On By The "Hactivists"
Well that was fast, no? Another year is nearly in the books, and it's kind of been a rough one, as far as the news goes. Millions of people throughout the world have faced war, displacement, terrorism, and, of course, "collateral damage." And in the United States, specifically, you've got a wild-eyed demagogue leading in the Republican presidential primary, the scourge of black Americans being killed by police officers, and more mass shootings than there were days in the year. So what will Anonymous do in 2016? Sorry if your neck whipped from that segue, but it's not as odd a question as it might initially seem. Plenty of folks don't usually think about the possible implications of skillful, coordinated hackers working toward ostensibly common goals. And that makes sense, really; whether you're not quite tech-literate enough to get a grasp on those kinds of stories or you perceive Anonymous as an inherently chaotic, unpredictable group, it's easy to feel lost when you try to familiarize yourself with their plans. But on the basis of what they've done recently, and where the United States and the world is headed in the coming year, here are a few predictions for what Anonymous will be getting up to in 2016. If you've watched Netflix's Making a Murderer, you've heard Avery's story — although its narrative doesn't actually present him as a genuine murderer. Rather, it suggests that Avery's case was plagued by various issues which point to his possible innocence, including allegations of coerced testimony and falsified evidence. The prosecutor in the case has denied the allegations and accused the series of omitting crucial evidence. Basically, it's the same fraught back-and-forth that often comes from these kinds of "true crime" shows. But this week, Anonymous hopped into the fray as well, with two supposed members of the group alleging that they've uncovered phone call records and emails which support allegations of Avery's wrongful conviction. Considering the new year is nearly upon us, you'll almost certainly hear more about this story in 2016. Anonymous is controversial in the halls of American power. Needless to say, governments don't like the security vulnerabilities that they can expose, nor the secrets that can potentially be brought to light. But at the moment, the group is maybe riding as positive a wave of public opinion as it ever has, thanks to its decision to target ISIS on social media, among other things. It's a new digital frontier in what's otherwise been a bloody, earthy battle, and it doesn't seem like Anonymous has any plans of slowing things down. On the contrary, they're now launching cyberattacks against the Turkish government, on the belief that they've been supporting ISIS. Obviously, whether or not that's actually true looms large. The problem with groups like Anonymous is that the hacking skills involved are so opaque to average people that you're sometimes forced to take their claims on faith, and they have gotten things wrong before, with considerable consequences. Their aggressive work rooting out ISIS-linked social media accounts speaks to this. The import they've placed on this cause is obvious, even as the veracity of their list of ISIS Twitter accounts has earned them some withering scrutiny. Last week, it was reported that Anonymous endorsed Democratic presidential candidate Bernie Sanders, which would be a rather out-of-character move for them. They're usually not so overtly political as that, owing in part to the fact that they're an ostensibly worldwide collective of hackers, and no group that large and diverse is going to have complete political agreement. Update: While it’s awesome, and an honor, that so many seem to agree with these reasons, the opinions are strictly mine own. Obviously, plenty of Anons do agree, but it would be a bit presumptuous to say that all of Anonymous backs Bernie Sanders as some might suggest. That said, if the group were to do anything in service of any particular American candidate, Sanders would seem a safe bet. The appeal of his brand of anti-establishment socialism is pretty plain to see.